Beyond all the: shooting, car chases, rocket escapes, and vicious alien creature attacks; this book offered more than just a thrill ride. It’s a story about the environment, and reminds the reader that making mistakes with mother nature can have negative repercussions. Namely, she’ll eat you alive. Now in addition to its philosophical points, this book will be a great learning tool for budding writers because it employs an interesting narrative technique. The entire book starting from page one is written from only the protagonist’s (Jason dinAlt ) point of view. It never changes, and is so skillfully done I actually thought it was first person at times. 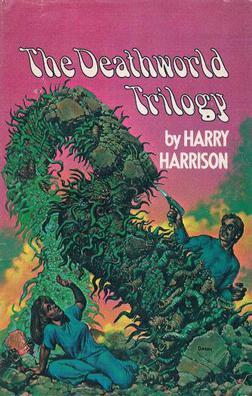 But Harrison keeps the narration in Limited 3rd, and seamlessly keeps the reader absorbed the whole time without effort. I think few books pull this off better. The plot also maintains high level drama and mystery the whole way through. So much so, it’s a wonder this book (and its two sequels) were never made into movies: it’s a CGI guy’s fantasy come true. So for now, you’re going to have to just read it and use your imagination. Don’t worry though. Even without CGI, it’s worth it. 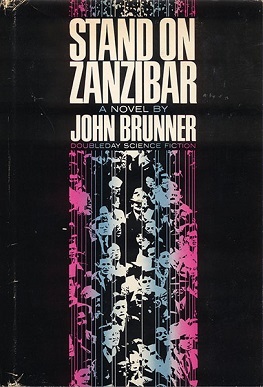 I’m currently reading Stand on Zanzibar by John Brunner, and I’m quite impressed. In my opinion they don’t make Science Fiction like this anymore. Publishers would reject this kind of avant-garde writing straight out. Why? Well, if one were to follow all the pedantic rules editors blindly follow these days, it breaks them all. And I mean all of them! But that is exactly why I love this book. It’s true science fiction, and tries to portray a world gone haywire with overpopulation. Of course no one is up in arms over such a topic these days, but one has to awed by Brunner’s attempt to challenge and edify the readers of his time. I almost mistook this book for being written in the first person. The POV is from Jason, and we follow him from one scene to the next. Even without the First Person, It does not lead to any monotony at all, and I was quite impressed with the effect. It makes you feel like you are there. “Wait-I can’t take it now, you’ll have to return in the morning, to the bank. In normal business fashion,” Ellus decided firmly. Kerk reached over and gently drew the paper out of Ellus’ hand. I myself would be tempted (or at least consider) to put “Kerk reached…” prior to his dialog and drop the, he said. However, I see that the dramatic effect of taking the check from Ellus’ had is greater by using a one sentence paragraph. Solid fuel launchers exploded and blasted the lifeboat clear of the parent ship. Their brief acceleration slammed Jason to the deck, then he floated as the boat went into free fall. The main-drive rockets didn’t fire. In that moment Jason learned what it was like to know he was dead. Without fuel the boat would drop into the jungle below, falling like a rock and blasting apart when it hit. There was no way out. The paragraphs are broken up and we have these nice “short” ending sentences that have a punch. I liked this effect and I remember it sounded good too when being read.